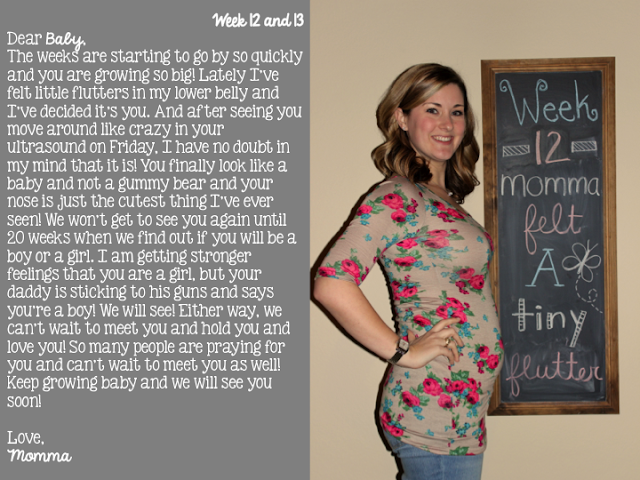 week 12 and 13- bump update and letters for baby - The Mrs. & Co.
Total weight gain: 3 pounds so far! I'm pretty impressed! I'm enjoying being able to get to the gym more often now! Best moment this week: seeing baby roll around and be a little TOOT in our ultrasound on Friday. Wouldn't cooperate and the sono tech had a tough checking on all of baby's anatomy! Anything making you queasy or sick? Nothing too bad anymore. Occasionally I will smell something that will set me off, but not as often. Gender: We don't know yet but the heart rates have been high at 184 and 162 bpm and the old wive's tale says girls have faster heart rates. We will see! Happy or moody most of the time: I am happy! I've started feeling baby flutter around in my tummy and I love it! Looking forward to: finding out baby's gender in 6 weeks! Hoping time goes back quickly! You are glowing! So beautiful! Love that shirt, too! You look great!! I have the same shirt and love it!!! That's so crazy you're already feeling movement! 2nd trimester ALREADY?! :) That's so awesome that you are going on a cruise! 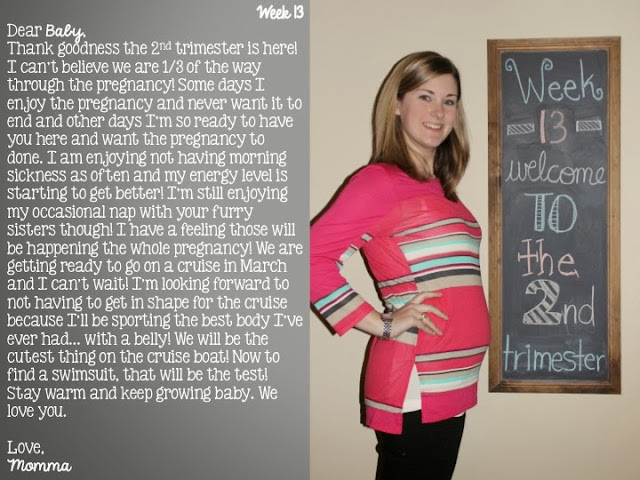 Have you found any cute maternity bathing suits? Hiya, I’m really glad I have found this info. Today bloggers publish just about gossip and net stuff and this is actually irritating.